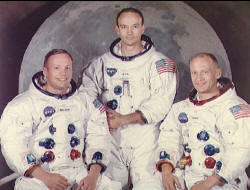 Apollo 11 astronaut Neil Armstrong died today, August 25, 2012. As most Americans over the age of 30 know, Armstrong was the first human to step foot on the moon. 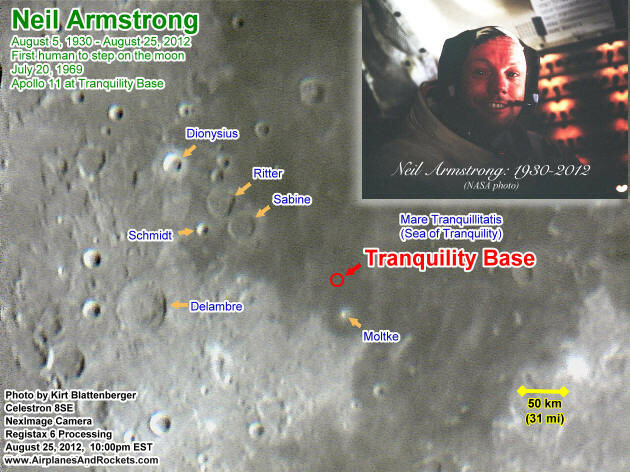 On July 20, 1969, in fulfillment of President Kennedy's 1961 challenge to put a man on the moon and return him home safely by the end of the decade, Armstrong made a giant leap for mankind. Apollo 11 and its crew of three blasted off from Cape Canaveral at 9:32 EDT on the morning of July 16, 1969, sitting atop a Saturn V rocket. A month later I would be turning 11 years old, but the model rocketeering bug had bitten years earlier. Earlier in the year Estes (the model rocket company) announced a program offering to send a certificate to anyone who launched a rocket within 24 hours of the Apollo 11 launch. Fortunately, school was out for the summer, so after watching the event breathlessly on our crummy B&W television, I dutifully marched into the back yard and launched my Alpha into the wild blue yonder. About half the time (or so it seemed) my rockets ended up in a tree or on a rooftop, but this time the Alpha actually landed near the launch pad. I filled out the application, had my parents sign to witness that I wasn't lying, and mailed it off to Estes' HQ in Colorado. An eternity later it arrived in the mail. Like almost every other thing I ever had as a kid, the piece of paper no longer exists but the memory does. Fast forward 43 years and it's now 2012. Yesterday, August 25, I heard the sad news that Neil Armstrong had died. As a final commemoration to his lifetime of achievements, I took advantage of the clear (albiet windy) skies and the moon being just past its first quarter phase and took this photo of the region where Apollo 11 made the historic broadcast back to Earth reporting, "Houston, the Eagle has landed." A Celestron 8SE telescope was used with the NexImage camera and image processing using Registax 6 software. Thank-you, and rest in peace, Mr. Armstrong. Here are a few items I've written about the Apollo program over the years, if you're interested. from Spacecraft Films on Vimeo. "This clip is raw from Camera E-8 on the launch umbilical tower/mobile launch program of Apollo 11, July 16, 1969. This is an HD transfer from the 16mm original. Even more excellent footage is available on our DVDs at our website at spacecraftfilms.com The camera is running at 500 fps, making the total clip of over 8 minutes represent just 30 seconds of actual time. Narration is provided by Mark Gray (me), Executive Producer for Spacecraft Films."